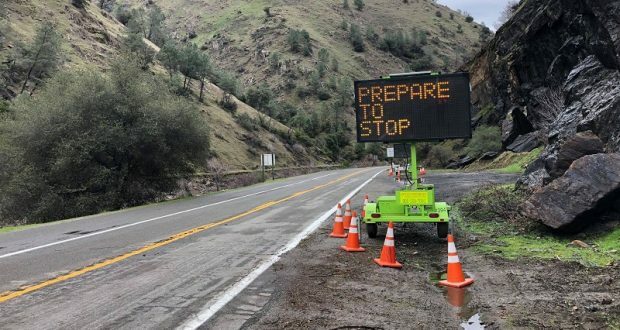 MARIPOSA COUNTY – Once again, the California Department of Transportation (Caltrans) is planning a preemptive closure of State Route 140 in and near the Ferguson Fire burn scar ahead of a major storm. The highway will be closed beginning at 3 p.m.on Wednesday, Feb. 13. “This closure is being prompted by an ongoing storm that could impact the roadway, and the closure is scheduled for the sake of public safety,” said Caltrans in a statement released today. The estimated time for reopening is dependent upon the impact of the weather. The closure will extend approximately 17 miles – from Bear Creek near Midpines to Foresta Road in El Portal – approximately 4 miles west of the Yosemite National Park entrance. Risks for this stretch of roadway in storm conditions include mudslides and the movement of debris and rocks onto highway lanes, says Caltrans. After the storm has passed, Caltrans crews will clear any debris and inspect the road before reopening it to traffic. To stay current on this closure and other news regarding the impact this storm is having on transportation, please follow District 10 on Twitter, download the Caltrans QuickMap app to your phone, call 1-800-427-ROAD (7623) or check the Caltrans website for highway conditions. This closure is scheduled to begin as listed, but is subject to change due to traffic incidents, weather, availability of equipment and/or materials and other issues. Chains or snow tires are currently required in Yosemite Valley. Badger Pass Road/Yosemite Ski and Snowboard Area is open. R2 conditions—4WD with snow tires or chains. Highway 120 in Yosemite requires chains. ALL VEHICLES, INCLUDING 4WD OR AWD, MUST CARRY CHAINS. Call 209-372-0200, dial 1, then 1 again, for conditions inside Yosemite National Park. Call 559-565-3341 then follow prompts inside Sequoia/Kings Canyon National Park. Call 800-427-7623 for California highways outside the national parks.